Over the past year I've had the opportunity to review a number of plush toys/puppets which make great gifts for children, teens and even for adults! What made these reviews even better, is I was able to give some away, too! When you think about plush toys/puppets you have to think about Folkmanis - they have the most amazing plush puppets! I especially love the Folkmanis Basset Hound Puppet . . . after all, I do LOVE Bassets and Folkmanis did a fantastic job of capturing the look of these sweet hounds! My youngest grandson loves the Basset puppet we have - he kisses its nose every time he picks it up - which is often! When I think about favorite plush toys I've reviewed, I have to include Husky the Jingle Pup and Bigsby the Big Foot from Hallmark! These plush toys interact with the story books which come along with them and are a unique and fun toy which is sure to delight children - and adults, too! I particularly found Bigsby to be great fun . . . what could be more fun than a talking, plush Big Foot to love? Especially when he comes with a great story?!!! Finally, one of my favorite plush toys is Truffles, the elephant from Signals! 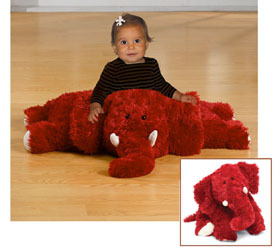 Truffles is big, floppy, soft, snuggly and the most beautiful color of red! Truffles is sure to be a great friend for many years for any child who receives it! When I was a child I had a plush, red monkey and a plush tiger which were my favorites. What was your favorite plush toy when you were a child? These are so cute. My son who is 11 still enjoys his stuff animals. It gives him comfort.